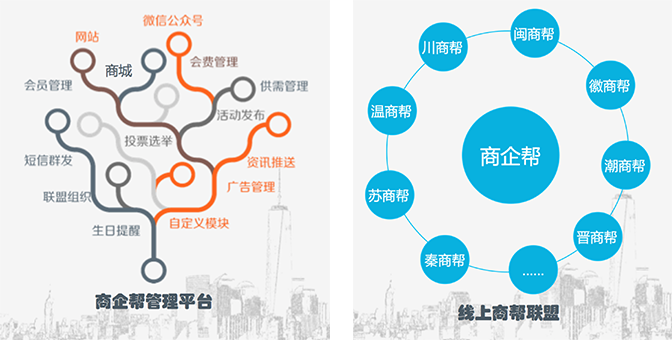 Commerce Enterprise Group is a kind of internet intelligent management system that serves the global business association, overseas Chinese group, government platform and all kinds of social organizations, it aims to build a global resource sharing platform of industrialization, standardization and internationalization. Commerce Enterprise Group provides a set of daily operation and office management system tailored for the business association, and helps it complete daily work efficiently, and enhance the efficiency of communication and cooperation among business associations in an all round way through the systematic solutions; Provide technical support for the cloud platform construction of the business association, help each business association to quickly create and upgrade personalized official websites and public numbers; Open up the information channel between different business associations, realize the information exchange between different business associations and business groups, and interact with each other to enhance the service extensibility and interaction ability of individual business association; Assist the business association to link the government and global quality service resources, push more specialized, fine, in-depth directional service for the members, upgrade the service ability of the individual business association. Commerce Enterprise Group discusses and implements global business association service standards and systems through online construction of global business circle, offline landing of joint operation center, builds a trinity resource sharing platform, promotes interaction, integration, collaborative development of global trade association, thus driving global trade and investment.